last 40 years. His manufacture and servicing kilns keeps him in touch with prominent ceramists, colleges and industry. Harry continues to direct and develop his school. medium to create contemporary thrown multiples. Robert’s work is shown and collected nationally and internationally. He is co-owner of the Miller-Durazo Contemporary Fine Art Gallery. 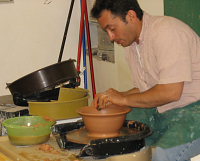 He is a college instructor and has been teaching at The Cahuenga School of Pottery for 12 years. Nikki received her B.F.A. from Kansas City Art Institute and her M.F.A. from UCLA. She throws exquisite delicate functional work with intricate handles and fluted lips. Her work has been exhibited nationally. She is a college instructor and has been instructing at the Cahuenga School of Pottery for 6 years. William is an assistant instructor and studio technician. He participates in loading and firing kilns, instructing students and overseeing the studio. He is a prolific ceramist, shows and sells his work. He has been at the studio for 3 years. William shares, nurtures and is attentive to all students.